Relying on the theoretical model of [Lyubomirsky et al. 2005, Review of General Psychology, 9, pp. 111–131], the present study investigated the relationship between personality, number of friends, best friendship quality and happiness among 423 young adults (n = 300 women). The main interest was to examine whether friendship contributed to happiness while controlling for personality. 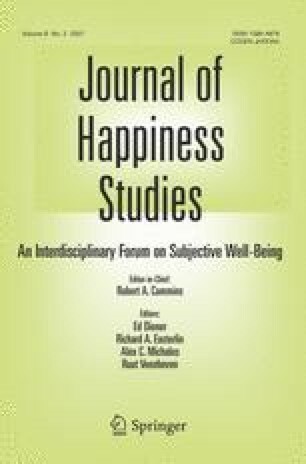 Friendship variables accounted for 58% of the variance in happiness. Results revealed that friendship quality predicted happiness above and beyond the influence of personality and number of friends, but friendship conflict was not a significant predictor. Additional analyses revealed that the companionship and self-validation features of friendship quality were predictive of happiness while controlling for gender and personality. The findings were discussed in the light of theory and empirical research and suggestions were made for future research. The authors would like to thank Douglas Barnett for his support and assistance throughout this research project.